Getting desperate to sell your home? Try burying a statue of St. Joseph in your yard. Some people may not believe and some may think it’s hokey, but we say: why not? Right now, the market in the Pikes Peak region is a seller’s market, but what happens if you have a hard-to-sell property or the market turns again and it becomes difficult to sell your home? You may find yourself frustrated by the length of time your home is languishing on the market. It is a helpless feeling that some of us know all too well. 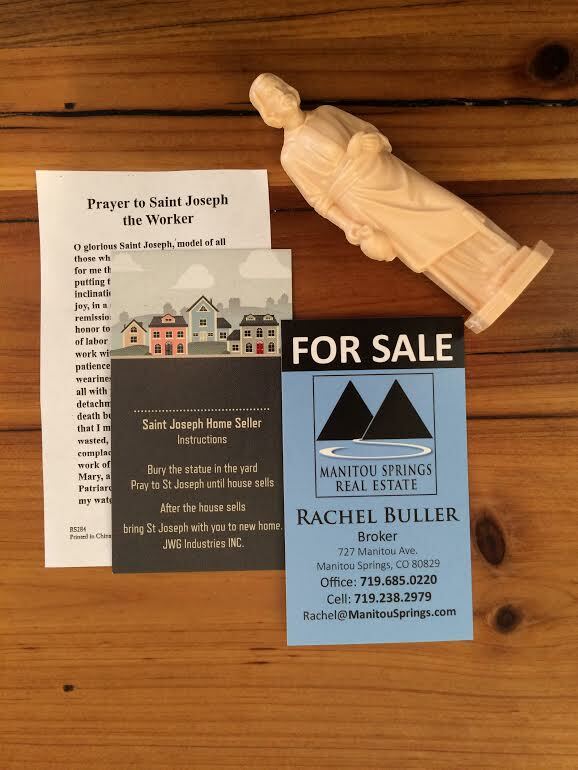 One trick that some Realtors have been suggesting for decades is to try burying a St. Joseph statue in the yard to usher a quick sale. St. Joseph is the Catholic patron saint of “The Home” (and many other things) and by extension, the patron saint of buying and selling real estate. Some say this is because Joseph was a carpenter by trade. How exactly is it done? The tradition involves planting a small St. Joseph statue upside down (about 6-12 inches deep) in the lawn or garden of the home near the for sale sign while simultaneously praying for divine intervention to sell the home. There is some disagreement as to whether the statue is supposed to face the house needing to be sold, or whether it should face outwards in the direction of the house you want to buy. In any case, the statue should be dug up once the house sells, and taken with the seller to their new residence where it should be kept in a place of honor somewhere inside the home. There’s only one way to find out… try it and see! Our agent Rachel Buller offers a complimentary version of the St. Joseph home selling kit for all her new listings. Give Rachel a call to see how she can help you sell your home quickly and efficiently. Manitou Springs Real Estate is a full service licensed real estate company in the state of Colorado that specializes in Manitou Springs but serves the entire Pikes Peak region. Our agents have over a century of combined experience and we have been in business for over 18 years. Copyright © 2018 Manitou Springs Real Estate. All rights reserved.